An Inhotim figure made its radiant appearance in NYC this past summer, at the New Museum of Contemporary Art, in the event of displaying her actual very Brasilian exuberant art-work. Born in Belo Horizonte, Rivane Neuenschwander covered the walls with hundreds of bright colored similar ribbons printed with virtual visitors wishes. 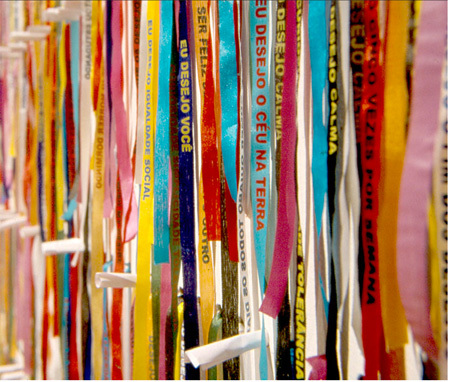 A genuine storyline its origins belong with the church of Nosso Senhor do Bonfim in Salvador, Bahia: here the faithful tie the silk ribbons to their wrists and to the gates of the church and—still relative to tradition—their wishes are granted once the ribbons wear away and fall off. —Meu nome é Gracinha, e o seu…? We made our choice, we extracted it from the wall, and replaced it with a new wish, which we wrote on a slip of paper and dropped in the slot of a certain white box… there, in behalf of the actual purpose. A wheel of fortune, the everlasting project generates new ribbons, which generate new dreams… As yet in our wonderment we walk over to the 2nd floor. Eric Laurent’s extraction operation still lingering in my thoughts, was the pink ribbon around my ankle gleaming? If the Other from where my wish was withdrawn is a rainbow wall, its lack would be a hole in the shape of the pink ribbon I deprived it of. Outside/Inside, what did I give back in the written, on the piece of paper I let go through the slot in the white box? 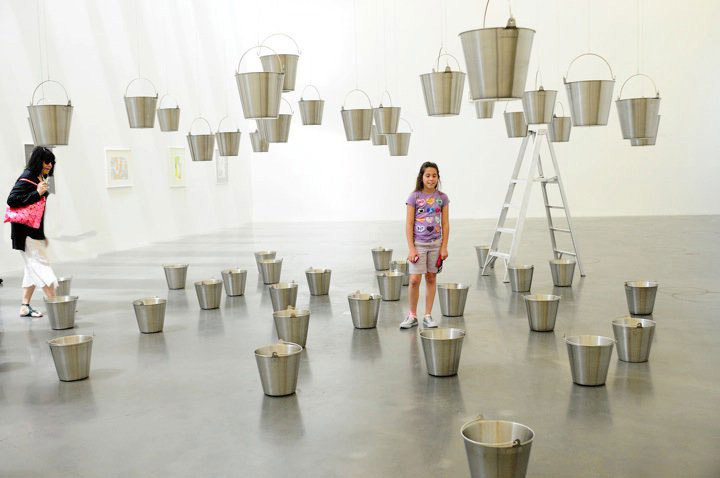 Aluminum Buckets, Steel Cable, Ladder, Water. Purchase Lacanian Ink click here.